On November 15, 2018, J. Barclay Collins II was elected Chairman of the Board of The New York Botanical Garden. He also currently serves as Chairman of the Executive Committee. He has been a longtime distinguished senior executive in the energy business. You have been involved in leadership in many not-for-profit organizations. What sparked your interest in NYBG? My non-profit service and philanthropy is based on a deeply held belief that one has an obligation to help make the world a better place. This has led to my involvement in many cultural, educational, and preservation organizations, and others dedicated to population health and protecting the environment. My particular passion for NYBG has its origins in my childhood in Gettysburg, Pennsylvania. Before my father started a successful business career, he was a farmer, and he grew the best vegetables imaginable—tomatoes the size of grapefruits! And beautiful roses. I spent many happy hours roaming the Gettysburg battlefield’s beautiful southern Pennsylvania landscape. I am an Eagle Scout, and in achieving that rank I experienced my first exposure not only with forests and native plants, but also with the science of botany. My NYBG interests include landscape architecture and garden design as well as our world-class botanical science programs. How did you become involved in NYBG leadership? We have gardens at our home in Sharon, Connecticut—English-style with many perennial borders; and we had been attending NYBG events for several years. My good friend Lionel Goldfrank, who is now Senior Vice Chairman of the Board, had the good idea of tempting me to get further involved. 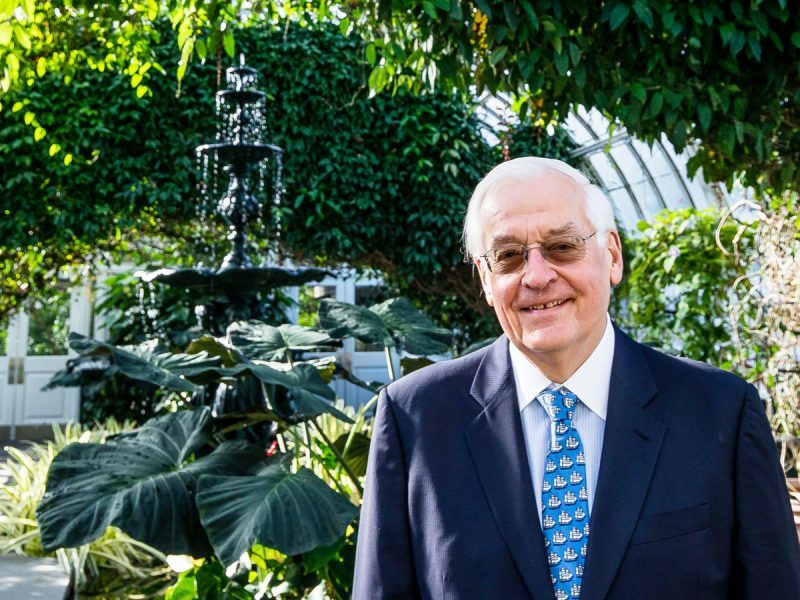 In 2007 he introduced me to then-NYBG President Gregory Long, and shortly thereafter I began serving as a non-Trustee member of the Budget Committee and as the Garden’s representative to the Board of the Cary Institute of Ecosystem Studies. Participating in the governing board of a large not-for-profit can be a tricky undertaking: the most effective boards strike a proper balance between setting strategic priorities, overseeing and supporting the chief executive officer and senior staff, being philanthropic, and connecting others with the organization, and not micro-managing! I feel my lifetime of experience in non-profit board governance, married with my passion for gardens, helps me make a contribution here at NYBG. What are your observations on NYBG’s role in the world today? NYBG is ideally positioned to make an impact on so many different fronts. Although the tradition began in the ancient world, the modern botanical garden has its origins in the 15th and 16th centuries, focused on botany and the collecting and describing of plant species. The garden, a botanical garden, was the place to preserve and display those specimen plants. First came botany, then horticultural display. We maintain that original design here at NYBG with a very strong botanical science program, unparalleled anywhere else in the world. Our herbarium is one of the world’s largest. We are effectively the botany department for several universities in New York. Our role worldwide, in identifying and saving the plants of the world, is extremely important, and one that is growing, particularly with regard to endangered species. We are raising awareness regarding issues of sustainability and biodiversity. Our activities in areas related to conservation of the environment, which is certainly under stress today, will continue to be a key focus going forward. Finally, we are a museum of living plants, and our horticultural collections and displays provide delight to our fellow citizens—of New York and the world. Vincent Van Gogh wrote to his brother, Theo, about his love for the garden in the center of Arles: he found it a place of serenity, and sociability. I like to think we provide the same: an urban oasis, and through our events and exhibitions a place for people to gather, find peace and inspiration, and engage in conversation. Do you have a favorite NYBG garden? I am so impressed with the Native Plant Garden: the architecture of the hardscape and the garden design are brilliant—the recent work of Sheila Brady of Oehme, van Sweden & Associates. The Peggy Rockefeller Rose Garden designed by Beatrix Farrand in 1916, which has garnered numerous accolades and awards, is also a favorite of mine and so many visitors. I grow roses and only aspire to a fraction of what our rosarians accomplish there. But my passion actually extends to all our outdoor gardens, and several years ago I was pleased to endow the Horticulture department’s position of Associate Vice President and Senior Curator for Outdoor Gardens. I am an avid sailor—I love being on the water. I am currently Chairman of Mystic Seaport Museum, service that combines my love of the sea and love of history. I have also been involved in health care for many years, currently Chairman of the United Hospital Fund of New York and on the Board of the Brooklyn Hospital Center. And very much aligning with our mission here at NYBG, I devote energy as a Board Member to helping other organizations in the fields of arts, education, historic preservation, and environmental protection.